Yet, everything moves and exists by this force. Its source, however, is hidden from us, as is the direction of its movement, its “vector,” goal, and why it moves and operates everything. This knowledge is revealed in the tabernacle as we correct and construct ourselves according to the influence of the upper force, in equivalence of form with it. Equivalence of form means that if He is good and does it, if He loves the bad, as well as the good , we must also achieve the state of “love your neighbor as yourself.” We build the tabernacle according to the gradual correction of our desires from egoism to bestowal and love. The Torah and the Talmud teach us that the tabernacle with all its details symbolize the correction of the soul. It is not about the construction of a beautiful building in Jerusalem, nor is it about physical tools. Rather, it is about man’s heart, man’s internal correction. It is written, “I have created the evil inclination; I have created for it the Torah as a spice,” because “the light in it reforms.” This is why it is written that only a person with a good heart should donate, for by that, one truly wishes to correct one’s heart. The donation is a gradual removal of egoistic desires that can be corrected from a state of separation and hatred of others to bestowal and love of others. The portion seemingly relates primarily to people who wish to sanctify themselves, build themselves in such a way that that source of energy, that superior quality, appears in them so they may know where life and all our energy come from and why, and where they are headed. Because of the comprehensive crisis we are in, we need information about this process. Without it, we will not know what to do. 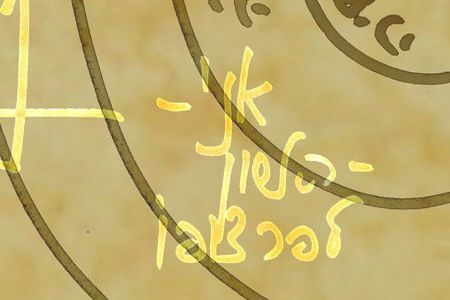 Those who study the wisdom of Kabbalah discover how they should proceed in life. In the past, if we encountered problems we knew how to overcome them because the world had not yet become round, global. But today, as the world has become that, the general law is appearing, making it possible to understand it and to work with it unless we ourselves become round. Now we are required to come out of ourselves, of the personal and individualistic mindset, and begin to connect with others. According to the common force appearing between us, namely the Creator—who is appearing between us as the dweller of the tabernacle—we will discover how to resolve the comprehensive crisis. This is what makes this portion so pertinent. As soon as we begin to follow the requirement of the Torah to build a tabernacle from out hearts, even to the slightest bit, we will begin to understand what is required of us in order to restore balance. When we understand the law of balance, namely the general law of reality, we will know how to resolve the crisis. Today we are perplexed and bewildered over what we must do with ourselves in the future. This is why we are being shown escalating destruction that cannot be resolved, not even through war or other tragic events. Therefore, we need to promote circulation of the wisdom of Kabbalah to show the solution to everything. This is the reason why Kabbalah is appearing here and now, so we may use the tools given to us properly. All we need is to fix them a little, and to gradually understand the Creator, reveal Him, and advance toward correction of the crisis, toward a happy life. It seems that the more we try to put order in the world, the more disorder we create. This is true only if we act on our reason. This is the situation today; everyone is trying to put things in order; no one wants disorder. True. Nature is drawn toward balance. We can see that if one place is hotter than another, after sometime the temperatures balance themselves out. Likewise, if there is high air pressure in one place and low air pressure in another, the wind equalizes the pressure. This is how the whole of nature operates. Nature’s movement always aims toward balance—from atoms through molecules, and to every part of nature. There are elements in nature where it seems as though there is no need to add energy. Electrons, for example, endlessly rotate in high speed. And yet, there must be energy propelling this constant movement. We have no idea where they receive the energy for it, but it is only because that energy lies beneath the threshold of our senses. Conversely, we know how many calories we must consume in order to function, or how much energy we have to spend in order to operate a machine. We test our energy sources, such as oil and gas, and build power plants and water drills using this energy. In truth, everything is in imbalance between those two levels, between the minus and the plus, and using the tension between them we build various things, such as batteries. Today we are witnessing a depletion of energy sources; we are running out of gas. We will receive the energy from the Creator. He is wearing us out on purpose so we may switch to energy on a higher level and learn how to use it properly. What, therefore, is the contemporary tabernacle? Is it the relationships between us that we must establish in this manner? Yes, we have no choice. If we establish proper connections between us—of love or at least of Arvut (mutual guarantee), namely become responsible for one another—and understand that we are parts of a single system, we will discover the power source and its program (software). Then we will learn what is right and how to use it properly. We are talking about an energy that induces equilibrium in movements between negative and positive. How is this energy, which we called the “tabernacle,” to make this equilibrium happen? We do not discover the energy in the tabernacle, but rather its source, the Creator. The energy, the force we receive from Him, is the power of bestowal. This the power that is missing in the world. There is plenty of matter in the world; all that is missing is the power to activate it, the power of bestowal. These days we are learning how incapable we are of working with the powers we do have. The problem is that we have no shortage of negative energy, but of positive one. When we connect “as one man with one heart” (RASHI, Exodus, 19b), according to Moses’ explanation concerning the building of the tabernacle, through that bonding we come to the place where the quality of the Creator appears, namely the upper force. This is the source of energy we call “light.” Indeed, even physics regards light as the “highest” form of energy. When we are in balance, we are certain to succeed. Moreover, success is not only in this transient life, but also in connection to the upper force, as we flow in the flow of eternal life in accord with it. Following the tabernacle, will we receive the right kind of energy? We will receive it in the tabernacle. The Creator is revealed in the tabernacle, which consists of only our corrected desires and the bonding with alien and different desires that were previously hateful and resentful toward each other. By leaping over them and uniting appears that upper force. This is how we discover the single force called “the upper force,” which we must discover. Without discovering it we gradually lose vitality, as is evident in the tendency that we are witnessing today. How will the new order of feeling as one be revealed? Through the deficiency. First we must understand that we are incompetent, we cannot succeed. By searching for the element by which we can succeed, we will discover the futility of these efforts. This—coupled with the development and circulation of the wisdom of Kabbalah through mutual guarantee—is when people will understand that we have no alternatives but to gradually connect to that eternal, complete, omnipotent and omniscient power supply, which is not only a source of energy, but much more than that. By and large, when people give a Teruma (donation), they want to be honored, remembered, and then the donation acquires an additional value. Is this the right direction? It is not. Teruma relates to the connection of the hearts. If a person attempts to use the donation in order to gain respect, notoriety, or appreciation as a great person, even if no one else knows of this ambition, it is still an egoistic fulfillment since that person does not connect to others, but rather patronizes them. How can this change so that it truly becomes a donation for the Creator? Helplessness will make people feel differently. Disseminating the wisdom of Kabbalah adds great powers to this transformation. It may seem like we are not doing much, but these actions are inducing many revelations of the Creator in the world. For now that revelation is on a level where people are headed toward that direction—searching, feeling that the connection between them can save them. We are seeing the riots in the world from the positive side, as well as from the (ostensibly) negative one. Through them we will discover that our only hope is to connect, that only connection will provide us with the force of life. When that happens, what will the donation be? The donation is the connection. If we appreciate the power of bestowal it is called “donating.” On the one hand, we extol it; on the other hand, we feel how lowly and base we are. The world is round, integral. It can be saved only through unity, and we are aware that we are the opposite of unity. We know we need the upper force to influence and connect us so we are in accord with nature, with the global world. How do we know that the Creator desires him and places His abode within him? When we see that man’s will is to chase and to exert after the Creator with his heart, soul, and will, we know for certain that Divinity is present there. Then we need to buy that man for the full cost, bond with him and learn from him. We learn about that, “And buy yourself a friend.” He should be bought for the full price to be rewarded with the Divinity that is in him. This is how far we must chase a righteous man and buy him. People who do not understand the meaning of the term, “donation,” think it is about money. However, donation pertains to a Masach (screen), which one projects from oneself, sacrificing of oneself. It is written, “Buy yourself a friend.” That is, one annuls one’s own ego and connects to another, wanting to break down the partition between them. Our hearts inherently want to be individualistic, egoistic, removed from others. And yet, we must be the exact opposite. If we want to connect to someone, we must be lower than that someone. This is the meaning of connecting, namely the donation. It is not as we are used to think about it; it is one who is willing to donate oneself—the heart and all of one’s desires and capabilities. When we donate we become included in others and thus connect. “I have created the evil inclination; I have created for it the Torah as a spice” (Babylonian Talmud, Masechet Kidushin, 30b). Baal HaSulam, The Writings of Baal HaSulam, “Introduction to the Study of the Ten Sefirot,” item 90, p 789. Midrash Rabah, Eicha, “Introduction,” Paragraph 2. Mishnah, Masechet Avot, Chapter 1, item 6.